Following the latest season of Wiggleywoo’s hit series, ‘The Day Henry Met...?’ being completed, Monster Entertainment have announced a number of new sales deals for the upcoming season and overall series. Season 3 has been pre-sold to Nick Junior in 178 countries, RTÉ in Ireland, Jetsen Huashi for digital rights in China, ABC Australia for Free-to-Air rights, Eesti Estonia for Free TV rights, TVP Poland for TV rights. Season 1 and 2 of ‘The Day Henry Met…?’ have recently been sold to BT and Virgin in the UK, Horng En Culture in Taiwan, Telefonica in Spain for SVOD rights and to TVP in Poland and LTV in Latvia for Free TV. New Frontier has taken publishing rights in Australia and New Zealand. The series is continuing to enjoy terrific ratings – e.g. in Italy, ‘The Day Henry Met…?’ has ranked 5th among the most viewed programs on free children channels in the 13:00-18:00 time slot, with a 13.32% share of viewers aged 4-7. ‘The Day Henry Met…?’ performed similarly to ‘Albero Azzurro’ and ‘Peppa pig’ and has also received a morning timeslot on RAI YoYo. The series has also been sold to 16 airlines including Virgin Atlantic, Emirates, Qantas Airlines, Lufthansa, Air France, Norwegian Air, and Cathay Pacific. The premise for the popular kids show sees Henry meet something new every day (or every episode) - The day Henry met a compass! The day Henry met a cookbook! 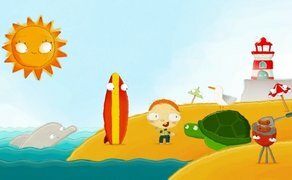 The day Henry met a Surfboard! Season 4, which will bring the number of episodes available to 104, is scheduled for completion in July 2019.